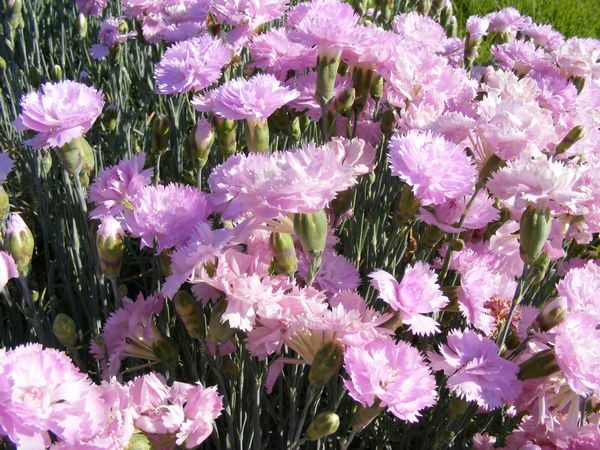 Clove Pink is the wild ancestor of today's garden carnation which have been developed into cultivars of diferent colors like yellow, white, red, etc. Clove Pink is a hardy perennial with greyish-green to blue-green slender leaves and intensely sweetly scented bright pinkish-purple flowers that attracts butterflies. It is loosely tufted and can grow up to 30cm. 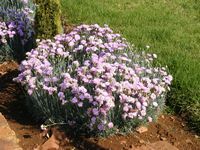 Needs sun and will grow in any well-drained alkaline to saline soil. Can tolerate maritime exposure and atmospheric pollution. Fresh petals, with the bitter white base removed, can be candied, pickled in vinegar, added to salads and be used to flavor fruit. They can also be used as a substitute for rose petals in making a syrup. At Mountain Herb Estate we use the whole flower to make a liqueur. The flower petals are alexiteric, antispasmodic, cardiotonic, diaphoretic and nervine. Treats coronary and nervous disorders. Today carnation is grown commercially in France for its rich clove-like essential oil that is used in perfumery. The flower heads are dried for pot-pourri and scented sachets. The plant is rich in saponins - the leaves can be simmered in water and used as a facial soap.